Haq's Musings: Can Congress Deliver in India? The convincing victory of Congress party in India has been an embarrassment for the pollsters and the pundits. They predicted a close contest between the Congress-led UPA and BJP-led NDA coalitions. With all but two results declared, the Congress-led alliance is projected to win 260 seats with the BJP on 157. They also said that the Third Front of regional and caste-based parties would determine the ultimate winners in Delhi. In fact, the Third Front has fallen apart, with its main components, the leftists, suffering a huge defeat, according to media reports. The BJP leadership has gracefully conceded defeat and congratulated Prime Minister Manmohan Singh on his party's success in the world's largest democracy. Congress routed BJP in the major cities of Delhi and Mumbai while the states of Karnataka and Gujarat remained in the BJP column, indicating a split verdict from India's middle class. Unlike Pakistan's ruling PPP whose vote bank is almost entirely rural, it seems that Congress has succeeded in putting together an effective coalition of the urban middle class and rural voters. Congress made significant gains in the Hindi heartland of Uttar Pradesh, where Nehru dynasty's heir apparent Rahul Gandhi campaigned energetically, winning plaudits and establishing his credentials as the next leader of Congress party. But UP Chief Minister Ms. Mayawati's Bahujan Samaj Party is still ahead of Congress. Her BSP remains a powerful force as it came in a close second for as many as 50 seats in UP. Voters appear to have backed Congress for pro-farm policies like the $5bn rural work scheme and a waiver of loans for indebted farmers. Five consecutive year of good monsoons, a booming rural market and pay increases for millions of government workers seem to have swung both the urban and rural voters towards the party that led India to its independence. As analysts and Congress party workers point out, there have been no major religious riots in the past five years, and so a vote for the party seemed to be a "vote for peace and harmony". While Prime Minister Manmohan Singh and his party engaged in angry rhetoric and issued verbal threats to Pakistan after Mumbai attacks, they did not act hastily in spite of the hostile Indian media and the BJP's attempts to take political advantage of the situation. Hopefully, the election results will also mean continuity in India's relations with its neighbors and the US, and early resumption of dialog with Pakistan to ensure peace and stability in South Asia. This is specially important as Pakistani military is in the middle of an offensive against the Taliban. With a strong mandate in hand, Congress faces a serious challenge in delivering to its urban middle class and rural constituents in the midst of global economic slowdown. According to an OECD report published in 2007, India generated 11.3 million new jobs per year on an average during 2000-2005. The decline in foreign investment has taken a big toll on sectors like real estate, manufacturing and infrastructure. In the last quarter of 2008, the economy’s growth rate plummeted to about 5.3 percent, the lowest in five years. While consumer demand has kept the economy growing so far, the sudden slowing in the flow of foreign funds and rising unemployment will make it harder for the country to grow fast enough to pull hundreds of millions of people out of grinding poverty. Widespread poverty, chronic hunger, non-existent sanitation facilities, poor infrastructure and lack of opportunity continue to be a cause for serious alarm for India's democracy. While Indian economy has experienced strong growth during this decade, the majority of its people have not been touched by it. Recently, British Minister Alexander contrasted the rapid growth in China with India's economic success - highlighting government figures that showed the number of poor people had dropped in the one-party communist state by 70% since 1990 but had risen in the world's biggest democracy by 5%. In spite the recent Congress efforts in rural areas, the rural landscape in India still remains troubled. On its inside pages, the Times of India in 2007 reported Communist Party leader Sitaram Yechury's as saying that "on the one hand, 36 Indian billionaires constituted 25% of India’s GDP while on the other, 70% of Indians had to do with Rs 20 a day". "A farmer commits suicide every 30 minutes. The gap between the two Indias is widening," he said. Over 1500 farmers committed suicide last year in the central state of Chhattisgarh alone. Violence is rising in India because of the growing rich-poor gap. Prime Minister Manmohan Singh himself has called the Maoist insurgency emanating from the state of Chhattisgarh the biggest internal security threat to India since independence. The Maoists, however, are confined to rural areas; their bold tactics haven't rattled Indian middle-class confidence in recent years as much as the bomb attacks in major cities have. These attacks are routinely blamed on Muslim militants. How long will Maoists remain confined to the rural areas will depend on the response of the Indian government to the insurgents who exploit huge and growing economic disparities in Indian society. With the clear mandate for his Congress Party, Prime Minister Manmohan Singh has huge challenges in front of him. Being a sincere man of intelligence and integrity, I expect him to make a serious effort to confront those challenges. I congratulate him and wish him well. If Mr. Singh succeeds, a prosperous, self-confident India under his leadership can become a positive example in South Asia that India's neighbors can look up to and follow. India is far better than pakistan. 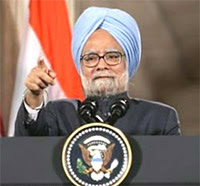 Singh is the person who had lead india from 1991 from near insolvency. Indian election has proved that india is still secular and is more concern about development rather than moving backward on medival path. You have the right to throw stones on india and india can use the same to build its forts. If Mr. Singh succeeds, a prosperous, self-confident India under his leadership can become a positive example in South Asia that India's neighbors can look up to and follow. Indeed. India is surrounded by fire at the moment. It's a wonder that the most exciting thing happening in India was an election. A look at the neighborhood is depressing: Pakistan in civil war flames, Bangladesh in political/military flux, Sri Lanka in civil war flames, Nepal in jeopardy, Myanmar being stubborn. The first task is to bring the poverty rate from 25% (or 35% depending on who you listen to) down by 10 points in the next 10 years. Then get to fixing the neighborhood using big power strategies: soft power as far as possible with hard power guarantees. And push the encroaching Chinese sphere of influence back. good news is fascist party in India missed becoming a majority by 5 - 10% votes. Bad news is there are still a lot of extreme nationalistic fascism and inferiority complex among Indians. Nazi type party getting second highest vote count would be concern in any other country but we can breath sight of relief it did not come first in India. The Indian stock market loves what happened. Now MM Singh - I'm no fan of his - has no excuse. He's got to deliver. The word is he'll be PM for a couple of years and then usher Rahul Gandhi in. Always though that dude was a dodo. But reading and hearing about what he did in UP has changed this reader's mind. Better to have an energetic youngster who wants to make things happen, has a servant mindset and makes mistakes along the way than the geriatric fools who spout old tired ideology. Omar Abdullah in J&K gives this reader the same hope. Too bad Sajjad Lone did not win. "At least 153 of the newly-elected MPs in India have criminal cases pending against them, according to a study by civil society groups. Groups working on electoral reforms say the opposition BJP has the highest number of tainted MPs at 43 while the Congress party is number two with 41. The group has written letters to senior Congress party leaders with an appeal to keep these MPs out of the cabinet. Its an nice article ! I read your article's regularly! You are a surprisingly sane voice in the world of "mad jingoistic senseless patriotism " so common to the web/blog world of "Indo-Pak".Even such harmless and beautiful thing such as a "smile of child" or birth of an "endangered animal in some zoo on the sub-continent"
turns in ludicrous "Indo-Pak" issue finally zeroing on choosy abuses on each others religions and mothers! Frankly as an Indian I feel Pak is better in many ways but always had bad luck .In a lighter vein I say Indians are lucky that pakistan is obsessed with religion ,or else it would have been far far ahead! Mr.Haq,articles like these seems like a big(may be desperate)effort on your part to tell to the world that india has got many flaws,people are unnecessarily praising india,pakistan is better than india etc(you also go all the way to provide numbers to support your claim). It seems apart from your work the only thing you do is to collect information about anything which shows india in a bad light. Mr.haq,a learned person like you ( i see you have worked on 80386 micro chip and all) instead on focussing so much on india can focus on pakistan and try to find solutions for the millions of problems facing your country.In india noboby is going to be that interested in what you say but in pakistan i am assuming many people will defenitely listen to your views. We know we have problems and are trying to fight it out.Atleat we don't poke our nose in our neighbour’s problems(poverty,slums,civil wars etc)and write articles about them. As the saying goes "those who themselves live in glass houses shouldn't be throwing stones at other's"
China is definelty doing better than india when it comes to fighting poverty.But the fact you were not interested in mentioning was that it hides it poverty from the world,it doesn't fight it openly.When you say mumbai with six million poors have you ever realised why there are no poors in shanghai.All poors were thrown out to rural areas.In a democratic country nobody would dare to do that.So you see democracy has it's pros and cons. India has got a population of 1 billion plus.even if 20% of our population is poor,it would turn out to be a big number.It really doesn’t make sense on part of scholar like you to compare that number with that of countries like Angola,Nigeria,Pakistan etc because even if 100% of their population is poor it would still be less than India. Sir as an indian i would invite you to come to india and check out all the places here rather than just some slums,poverty which you seem to be interested in highlighting in your articles. amit: "Sir as an indian i would invite you to come to india and check out all the places here rather than just some slums,poverty which you seem to be interested in highlighting in your articles." Thank you for invitation but I have visited India many times and my impressions are based on personal experience and backed by credible published data." You suggest "India has got a population of 1 billion plus.even if 20% of our population is poor,it would turn out to be a big number.It really doesn’t make sense on part of scholar like you to compare that number with that of countries like Angola,Nigeria,Pakistan etc because even if 100% of their population is poor it would still be less than India." All the published are normalized for population differences and the fact remains that in terms of hunger and poverty and quality of life for gthe vast majority of Indians is compatable or worse than the people in sub-Saharan Africa. You say "It seems apart from your work the only thing you do is to collect information about anything which shows india in a bad light." You should worry about how to fix the problems India has rather than hide them because any discussion of India puts your country in "bad light". BTW, if you read more of my posts, I am also very critical of the terrible governance in Pakistan. In fact, I believe the entire South Asian region is among the worst governed and the most deprived in tems of human development, hunger, poverty, disease etc.